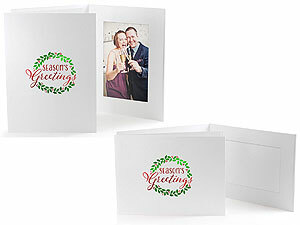 This holiday photo folder takes our standard white event folders and adorns them with a modern red & green "Season's Greetings" wreath foil stamping. The seasonal design is imprinted onto the front of the photo folder and is perfect for mall visits with Santa, winter dances, company holiday parties, winter weddings, year-end fundraisers, and more! Use it as is, or have it personalized by adding your company name, event, organization, or logo. Window opening size: 3-5/8" x 5-5/8"